This veggie burger is stuffed with veggies on the inside and stacked with even more on the outside. The base for this recipe came from one of my all-time favorite restaurants. Their veggie burger is to die for and one of the most popular dishes on their menu. I often find that veggie burgers are identifiable by one key ingredient; black beans, chickpeas, quinoa, tofu…the list goes on. But hardly do you find a veggie burger that doesn’t make one ingredient the star. This burger is a stand alone in a crowd of homemade veggie burgers. 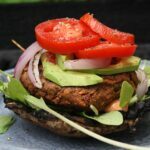 It is the Ultimate Veggie Burger because it is packed full of healthy goodness and doesn’t skimp on texture or flavor. I start off by cooking down vegetables and pureeing them into a paste before adding in whole beans and lentils. This creates a meaty, sticky texture while maintaining the integrity of whole beans. The patties freeze really well, making for an easy dinner any night of the week. Just form into patties, layer between parchment paper, stack into a zip lock bag and freeze. This veggie burger is stuffed with veggies on the inside and stacked with even more on the outside. Made with carrot, mushrooms, peppers, lentils, beans, oats, nuts, and seeds, this is the only recipe you’ll need for homemade veggie burgers. In a large skillet heat oil over medium until simmering. Add onion, celery, carrot and mushrooms. Cook until vegetables are soft and onion is translucent, about 10 minutes. Removed cooked vegetables from skillet and transfer to blender or food processor. Add roasted red peppers and puree until it forms a paste, scraping down sides as needed. Transfer vegetable paste to a mixer fitted with a paddle attachment. Add black beans, lentils, flour, oatmeal, sunflower seeds, walnuts, chili powder, paprika and parsley. Mix on low speed until well combined, 3-5 minutes, scraping down sides of the bowl as needed. Add cider vinegar and mix to incorporate. Taste and adjust seasoning with salt, pepper and additional cider vinegar. Cover and refrigerate mixture for at least 6 hours to allow flour and oatmeal to hydrate. Form into patties and grill over medium heat 7 minutes on each side or until heated throughout and just starting to crisp on outside. Can’t grill? Bake burgers at 375° F for 15-20 minutes or until sides are starting to crisp, flipping halfway through. I like to pile mine high on a lightly grilled Portobello with spicy mayo, arugula, charred tomato, avocado and tomato. These are also great served atop a lightly toasted bun. For a quick spicy mayo combine mayo with any hot sauce or hot spice. I combine mayo, lime juice, chili or chipotle powder and paprika. Sriracha, tobacco and cayenne pepper are also great heat sources.